Please email me your shipping info to scifiguy(at)scifiguy.ca to receive your books. Alpha Heroes has 5 copies of Santa Olivia by Jacqueline Carey and will giving away one per weekday starting Friday 5/29. To celebrate the release of The Cold Kiss of Death, the sequel to The Sweet Scent of Death, Susanne McLeod is having a giveaway - your choice of a signed copy of either of her books PLUS your choice of one of the Kitty books by Carrie Vaughn. To enter, just visit her site and comment telling her your favourite werewolf from fiction, TV or film. Author Michele Hauf is having a contest for the Faeries Gone Wild anthology signed by ALL the authors. Drop over to her blog to read the rules. 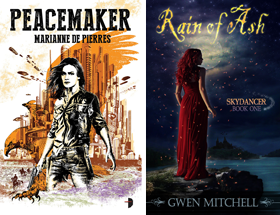 Fantasy & Sci-Fi Lovin' Book Reviews has a contest until June 12 for four fantasy anthologies, Ages of Wonder (Edited by Julie E. Czerneda), Other Earths (Edited by Nick Gevers), Terribly Twisted Tales (Edited by Martin H. Greenberg) and Swordplay (Edited by Denise Little). Another Santa Olivia giveaway is happening over at The Book Smugglers. They have five copies and the contest runs until Sunday night. And speaking of the Book Smugglers they also have a Flash Giveaway happening today only for two six-packs of paranormal books. Go there now! Author Jackie Kessler has details on her blog about how to win copies of her and Caitlin Kittredge’s superhero novel Black and White. Via Fang-tastic Books, details on how to win a copy of Blood Ties Season One on DVD. Anna’s Book Blog is celebrating its second anniversary starting Monday and will be running a month of contests. Check it out here. Rachel Vincent says on her blog you have a chance to win an early copy of Prey here, and an ARC of My Soul to Take here. An Aguirre is giving away four copies of Lyn Benedict’s Sins and Shadows. Details on her blog. Paranormal author Toni Andrews is holding a contest to celebrate the launch of the third Mercy Hollings book CRY MERCY, on sale June 1st from MIRA Books. You can win a SIGG aluminum water bottle and signed copies of the first two books in the Mercy Hollings series BEG FOR MERCY and ANGEL OF MERCY. To enter click here and follow the link just sign Toni’s Guest Book before May 31. Chloe Neill announced on her blog that Penguin has picked up books three and four in the Chicagoland Vampires series. No word yet on estimated publication dates. Lilith Saintcrow announced on her blog that Betrayals, the follow-up to her young adult novel Strange Angels is now available for pre-order on Amazon. It has a November release date. And here is video with Lilith discussing the first book. Lori Devoti (Amazon Ink) talks about the definitions of urban fantasy and paranormal romance over at Romancing the Blog. Good stuff! For those that may not have seen it, Publishers Weekly did a great story on urban fantasy this past week called When Love Is Strange: Romance Continues its Affair with the Supernatural. Also Marjorie Liu was interviewed for the piece and posted the full transcript of her portion of the interview. Check it out here. Want to see where Marjorie Liu does her writing? Check out her post on this weeks blog. True Blood based on the Sookie Stackhouse books by Charlaine Harris begins season 2 June 14 on HBO. For the most comprehensive coverage of all things True Blood visit Loving True Blood in Dallas. Wow, I thought I was going to have to wait until the spring of 2010 for the follow up to Strange Angels, I have to go pre-order it, Strange Angels was great. I'll have a review posted either today or tomorrow. Looking forward to your review Dottie! Blodeuedd certainly lots of contests. Enjoy!